This is a project by Luis A. Solorzano and Warren E. Savary. Over time, we hope to load the site with photographs and information about the flora and fauna of our home state, California. That's an ambitious project, and it will take time. Don't expect complete coverage right away (indeed, complete coverage will probably never be achieved without myriad "volunteers" to help out). In the meantime, feel free to browse through the site and see what we've encountered, photographed, and been able to work on lately. To browse, click on the taxonomic category of interest in the list below (in doing so, you just might learn a bit about how our resident plants and animals are classified), or use the search engine at the bottom of the page (a quicker option). Note that we have provided a translation of the English text (appearing in black) into Spanish (appearing in red) throughout the website. Este es un nuevo proyecto de Luis Solorzano y Warren Savary. Nosotros esperamos llenar esta pagina con fotografías e información sobre la flora y fauna de nuestro estado, California. Esto es un proyecto ambicioso, y tomara tiempo. No espere alcance completo inmediatamente. Mientras tanto, mire nuestra pagina y descubra lo que hemos encontrado y fotografiado recientemente. Para mirar, haga clic abajo en la categoría taxonómica de interés. El texto original es en ingles y de color azul. Tambien se conservan los nombres technicos en ingles en cada enlace. THE UNAUTHORIZED COPYING, DISPLAYING OR OTHER USE OF PHOTOGRAPHS OR OTHER IMAGES FROM THIS SITE IS A VIOLATION OF THE LAW. © Copyright 2002-2003, Warren Savary and Luis Solorzano (unless otherwise indicated). Unless otherwise noted, photographs and other images appearing in this website were prepared and are copyrighted by Warren E. Savary and/or Luis A. Solorzano. All images in this site, even if they do not include an individual statement of copyright, are protected under the U. S. Copyright Act. They may not be "borrowed" or otherwise used without our express permission or the express permission of the photographer or artist if other than Warren Savary or Luis Solorzano. Having said that, we would also like to point out that we are dedicated to protecting the California biota, supportive of efforts to study it (a pastime in which we ourselves engage as an arachnologist and algalogist, respectively), and enthusiastic towards efforts to educate the public about the fascinating flora and fauna of which it is comprised. To that end, you will generally find us willing to authorize use of our images and photographs for non-profit educational or scientific purposes. We might even be able to provide higher resolution copies of the images for use in printed media. Please use our e-mail addresses above to seek permission for use of any pictures or images. As perennial students of the California biota, we are always eager to receive reprints of scientific publications concerning the systematics or biogeography of its components, particulary papers focusing on patterns of endemism. If you are the author of such a publication and have a spare reprint, we wouldn't mind receiving a copy. 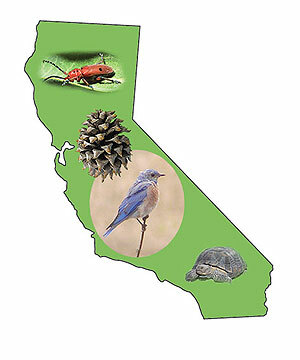 If we ever find the time, we would actually like to include in this site a bibliography that would be useful for others interested in understanding the origins of California's biota. Drop us an email if you can help out.